Guess which sentence applies to which side in the incipient struggle? So, here are a couple of graphs of data, on the US-China bilateral trade balance. 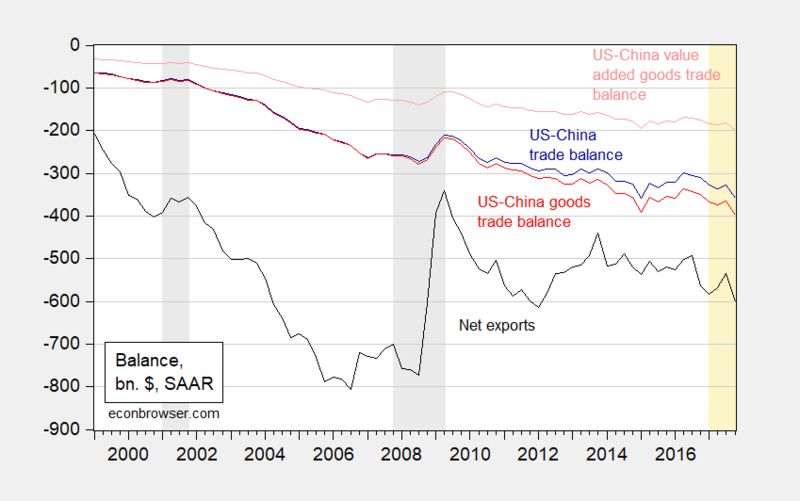 Figure 1: US-China trade balance (dark blue), US-China goods trade balance (red), US-China guesstimated goods value added trade balance (pink), US net exports (black). NBER defined recession dates shaded gray. 2017 data shaded orange. Source: Census, BEA, NBER, Oxford Economics Figure 7, and author’s calculations. The more relevant (from an economic perspective) variable is the amount of value added traded. In an era of global supply chains, bilateral final goods balances can be misleading. The value added series takes into account the fact that about 50% of the final good exported from China incorporates foreign content. This more relevant series [which I have approximated — see Oxford Economics (2017) Figure 7 for exact figures through 2015] indicates the employment loss attributable to US-China trade is less than is suggested by the gross figure of nearly $400 billion. Normalizing by GDP places the trends in context. 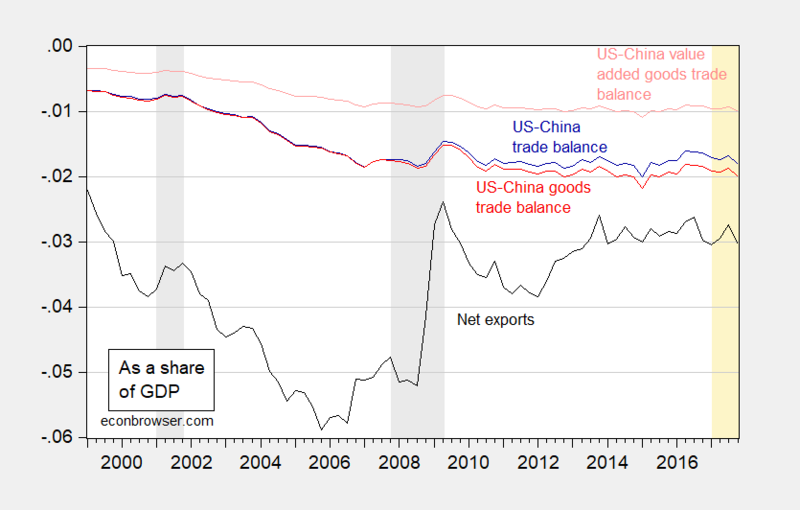 Figure 2: US-China trade balance (dark blue), US-China goods trade balance (red), US-China guesstimated goods value added trade balance (pink), US net exports (black), all expressed as a share of GDP. NBER defined recession dates shaded gray. 2017 data shaded orange. Source: Census, BEA, NBER, Oxford Economics Figure 7, and author’s calculations. The US-China goods balance in value added looks much more stable as a consequence. Something to remember as we risk the global trading rules based regime for improvement in the US-China bilateral balance. This entry was posted on March 22, 2018 by Menzie Chinn. The term of art here is processed trade. Classic example is the iPhone. Foxconn assembles some very expensive imported components in China but the Chinese value-added is about 5% of the price they charge to Apple. Of course most of the price we pay to Apple represents their obscene profits which somehow evades U.S. taxation. No one is forcing you to buy an iPhone – so, quit whining and complaining. What a stupid comment even for you. BTW – I use a Samsung. Oh wait Bottom Feeder’s job is to excuse tax evasion. Good luck evading those California sales taxes! Without looking at the Oxford link and deciphering some of this terminology I don’t have any deep observations here, other than the whole mess with China gives me a lot of mixed feelings. When have you ever seen US policy apply Sun Tzu? US has followed the opposite of: “no prince ever prospered by long war”. The paraduigm is “long way propsers the pentagon” using forward defense as excuse. Export-led China has much more to lose in the largest consumer market in the world, and U.S. multinationals can shift production from Communist China to the Philippines, Vietnam, Taiwan, etc.. With our allies support, including Japan and Europe, the Communist devastation will be even greater. And, regarding Russia, Trump made, and shamed, our European allies to spend more on their armed forces, and the U.S. is beefing up its military (although, after years of neglect). Three for three! Three comments – none of them even remotely related to the post here. Shift production to other Asian nations? Bottom Feeder does not get Menzie’s point. It is the production of soybeans in the good old USA. I think I’ve had enough of “winning so much”. Ed Hanson: If the intent is to reduce the aggregate trade balance in goods and services, then protectionist measures (or threats thereof) are unlikely to achieve that goal. In fact, the expansionary fiscal policy implied by the TCJA and the lifting of spending caps imply the reverse, as they will result in higher aggregate demand at full employment and a stronger dollar, crowding out net exports (functionally the same as the aggregate trade balance). I suggest you read Blanchard’s Macroeconomics and this set of notes that my undergraduate students are (supposed to be) reading right now. I seriously respect your instruction on exchange rates and dollar strength or weakness. So allow me to ask some questions. I agree that one expected outcome of the TCJA should have been a stronger dollar. But from the day the act was signed, a reasonably stable dollar (before signing) has weakened considerably. Trade and tariff changes were anticipated for months before the TCJA act was signed, so any impact should have already been accounted with in the exchange rates. What is causing the weakness, or is it perhaps my time period I am looking at is to short? Sorry not buying it. The according to monthly US EPU index uncertainty was higher much more volatile from 2007 to 2013. Uncertainty did not have that effect on the strength of the dollar. So while it may be true that “there’s nothing investors like less than uncertainty” it does not seem to hold. And then is the defense argument, but that should mean we should now see the dollar strengthen with the return to real rising defense appropriations. And finally his tariff idea of March 1 did not hold. Two ideas I had while thinking about it. The dollar may just be returning to it state it had before the financial crisis. This I find more and more likely. And two, I would entertain the idea that Treasury is intentionally through intervention or nonintervention to weaken the dollar, but no one has brought such evidence forward. I guess it all depends on what it is. Not buying your pure speculation either. Try this one, found it reading Scott Sumner over at Money Illusion. The discussion linked is from Julius Probst. Best answer I have read so far. It makes the point that when comparing exchange rates over an extended period of time, one has to consider how one nation’s price-level has evolved relative to the other nations. In other words, we should be looking at real exchange rates not nominal rates. I agree. Of course international economists do and they note that even real exchange rates vary a lot. Monetary factors as in the Dornbusch model play a modest role but there are a lot of real factors that drive exchange rates as well. One of the references used in the above copy/paste from Wiki: U.S. Army (c. 1985), Military History and Professional Development, U.S. Army Command and General Staff College, Fort Leavenworth, Kansas: Combat Studies Institute, 85-CSI-21 85. The Art of War is mentioned for each unit’s acquisition in “Military History Libraries for Duty Personnel” on page 18. Addendum: Am I saying this gives China the right to steal our technology/software and our best ideas?? NO. I am saying this bears Americans’ keeping in mind when we are getting a little arrogant about ourselves and what America has “offered” the world. Kinda makes you wistful for the glory days of Paul Manafort and Carter Page, doesn’t it?? I know the common man of Ukraine that got stomped on by Manafort’s pals in Kiev (whose puppet masters were located in Moscow) cry in mourning of Manafort every night. I think Manafort donated all those tens of millions of dollars in kickbacks he got from the Kiev bureaucracy to children’s charities, but don’t quote me on that, ok?? “China, whose industrial output now exceeds that of the United States, remains the world’s principal IP infringer. China is deeply committed to industrial policies that include maximizing the acquisition of foreign technology and information, policies that have contributed to greater IP theft. IP theft by thousands of Chinese actors continues to be rampant, and the United States constantly buys its own and other states’ inventions from Chinese infringers. China (including Hong Kong) accounts for 87% of counterfeit goods seized coming into the United States. China continues to obtain American IP from U.S. companies operating inside China, from entities elsewhere in the world, and of course from the United States directly through conventional as well as cyber means. These include coercive activities by the state designed to force outright IP transfer or give Chinese entities a better position from which to acquire or steal American IP. … The Commission still believes that IP theft is one of the most pressing issues of economic and national security facing our country. It is our unanimous opinion that the issue has not received the sustained presidential focus and strong policy attention that it requires.” Jon M. Huntsman, Jr., is the former U.S. ambassador to China (2009–11), the former governor of Utah (2005–9), and the Co-Chair of the Commission on the Theft of American Intellectual Property. … Governor Huntsman was appointed U.S. ambassador to China by President Barack Obama and confirmed by the Senate on August 7, 2009. Dennis C. Blair is the Chairman of the Sasakawa Peace Foundation USA and the Co-Chair of the Commission on the Theft of American Intellectual Property. He is the former commander in chief of the U.S. Pacific Command and the former U.S. director of national intelligence. Let’s unpack this. Suppose an American were offered two sports watches – one made by Oakley selling for $100 and the other being an Oakley knock off which are often made in Mexico with a price tag equal to $25. If this American buys the knock off, he saves $75. If he buys the actual Oakley watch, Oakley shareholders make out like bandits. Oh wait – we can play this game with Smart Phones made in China which cost $250 to produce but are now selling for near $1000 if purchased in the Apple store. So yea – protecting our IP means we are protecting obscene profits for Apple shareholders who get the added bonus that most of their taxable income is officially sourced in Bermuda tax free! In matter of principles, China will not back down even if the cost is 10:1 to China’s disadvantage, as manifested in the Korean War, war with japan and to lesser extent, confrontations with Russia, wars with India,Vietnam. In the case of current trade war with US, the cost to China is no where near 10:1 to China’s disadvantage but rather closed to 1:1 at least in the beginning. Even if trade wars escalate into conflicts of military nature, China’s odd is no where near 10:1 today. In any wars of attrition, who could last longer? In matter of IP infringements, I am sure the US have recourse via WTO or legal means, both in China and US courts, directly targeting those products alleged to have infringed IPRs. The US just need to prove the infringements to the courts.